Many people, when they get their scrubber running for the first time, get worried when more (not less) algae starts to grow on their rocks. It seems really strange, especially when nitrate and phosphate tests have been lower than before. What is happening is that phosphate is coming out of the rocks. Remember, phosphate is invisible, so you can only see the effects of it, and it always "flows" from higher concentrations to lower concentrations (just like heat does). Think of phosphate as the heat, and your rocks as the object, and your windows as the scrubber. As the scrubber pulls phosphate out of the water, the phosphate level in the water drops. Now, since the phosphate level in the water is lower than the phosphate level in the rocks, phosphate flows from the rocks into the water, and then from the water into the scrubber. This continues until the phosphate levels in the rocks and water are level again. And remember, you can't see this invisible flow. It's like a fast flowing, but shallow, river. And it can be much more phosphate than how much you are feeding each day. 2. 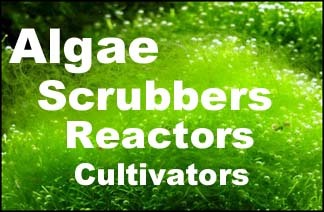 The scrubber is new, maybe only a few months old, and has recently started to grow a lot; possibly dark and thick. Since skimmers, filter socks, etc don't remove any nitrate and phosphate, and waterchanges and macro's in a fuge don't remove much either, most people have never seen the effects of large amounts of phosphate coming out of the rocks quickly. But sure enough, it can with a scrubber. How long does it continue? For 2 months to 6 months, depending on how much phosphate is in the rocks, how strong your scrubber(s) is, and how many other phosphate-removing filters you have (GFO, carbon dosing, etc). But one day you will see patches of white rock that were covered in green hair the day before; this is a sure sign that the algae are losing their phosphate supply from the rocks and can no longer hold on. Now it's just a matter of days before the rocks are clear. Last edited by SantaMonica; 09-09-2017 at 01:21 PM. There is one more point of view that I have read recently . Glenn (inventor of DSR method ) has not changed water in his marvelous tank for 8 years. So there something common with our system. And there how he explains PO4. Excess PO4 is being precipitated with Cations like Ca, Mg, K, Na into for example Ca3(PO4)2 and cumulate into you LR and substrate. So after a long time with extreme low PO4 levels it seems all PO4 dosing are being absorbed very quick into the system, only to suddenly overshoot when dosing. Now you know why you should be careful when dosing PO4 continuously. The other way around when you have had a long period of high phosphate levels, lowering phosphate take a lot time because the precipitated phosphate leak back into the water. There might even be a slight (measurable) increase Ca,Mg,Kalium level because of released cations. when you are to low on PO4 and NO3 and you need additional dosing, there is no need to skim off nutrient you need for you corals, so you throw out the skimmer. Exporting excess bacteria mass must be done with a good working skimmer. Dont be surprised. He actually is dosing his tank with P to keep it at low but stable point.